The M.S.R.T. is an affiliate society of American Society of Radiologic Technologists (A.S.R.T.). We strive for excellence and continuity within the radiologic sciences profession, including all the imaging modalities. We represent the almost 10,000 registered radiologic technologists in Michigan in all matters that affect the profession and the patients we serve. Advocacy is a huge part of what we are working towards. So often the radiologic profession is categorized as "just a button pusher". We all know that is NOT the case. However, it is up to US to educate not only the medical field, but our families, friends and patients about the amount of education we possess; education that is required to perform quality imaging exams for the people of our communities. Being a member does not merely mean paying dues. Being a member allows one to participate in the decision-making of the Society and to use the organization as a vehicle to meet one’s professional needs. This is done through networking, obtaining CEs, and through sharing one's knowledge with others. It is essential that all technologists - whether working full-time in the field or currently out of the field - actively support the Society to ensure our professional future. Although the Society has been successful in past endeavors, being a part of this group will serve to strengthen its voice and impact, both of which are and will be a huge part in effecting changes both nationally and statewide, both today and in the future of our profession. Our mission: To enhance the quality and safety of patient care by serving and representing radiologic science professionals through education, advocacy, and communication. We are a not-for-profit member association for radiologic science professionals. Established in 1956, this society continues to exist to advance the art and science of medical imaging and radiologic treatment specialties, to assist in establishing and maintaining high standards of education at all levels, to evaluate the quality of patient care, and to improve the welfare of radiologic technologists. ASRT Mission: The mission of the American Society of Radiologic Technologists is to advance and elevate the medical imaging and radiation therapy profession and to enhance the quality and safety of patient care. ASRT Vision: The American Society of Radiologic Technologists will be the premier professional association for the medical imaging and radiation therapy community through education, advocacy, research and innovation. We share a common purpose and give our personal best to transform ASRT’s vision into reality. We guide and inspire internal and external stakeholders to achieve ASRT’s mission and vision. We practice transparency by telling the truth, obeying the law, acting ethically, fulfilling expectations and keeping promises we make. We are adaptable and flexible to new possibilities and discoveries, and we provide an environment that encourages creative solutions. Being a member does not merely mean paying dues. It allows one to participate in the decision-making of the Society and to use the organization as a vehicle to meet one’s professional needs. It is essential that all technologists - whether working full-time in the field or currently out of the field - actively support the society to ensure their own professional future. Although the society has been successful in past endeavors, joining this group will serve to strengthen its voice and impact, both of which are integral in effecting changes both nationally and statewide. 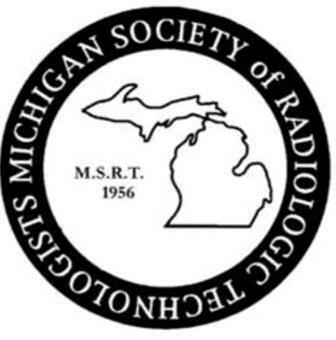 If you are not already a member of the Michigan Society of Radiologic Technologists, take some time, follow the link to our MEMBER PORTAL and become a member today! !